Jason Gillespie has spoken of his relief at being overlooked for the England job last year. Having broken back into the world’s top 15 for the first time in three years with a French Open semi-final run, Samantha Stosur has no intention of slipping away again. The time is right for Bernard Tomic to make his mark on world tennis, according to good friend and world No.21 Victor Troicki who says the youngster is putting aside his party lifestyle for the good of his game. Tennis wild child Nick Kyrgios has been slugged with a $6200 fine for an audible obscenity during his French Open thrashing at the hands of Richard Gasquet. A French Open that had promised so much for rising star Nick Kyrgios has ended with the fiery Australian conceding he was “absolutely destroyed” by French nemesis Richard Gasquet. Samantha Stosur has turned the tables on her horror record against fellow French Open runner-up Lucie Safarova to seal a fourth-round berth at Roland Garros. 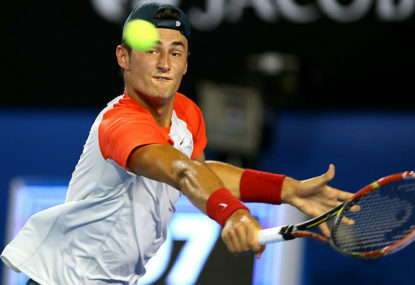 Bernard Tomic has been knocked out of the French Open following a four-set defeat in which he complained of dizziness. A third-placed finish on the medal tally at the track cycling world titles is encouraging for Australia, but national performance director Kevin Tabotta insists it’s the fourths and fifths which will pay dividends at the Rio Olympics in five months time. England rugby league coach Wayne Bennett has hit back at critics of his appointment, saying he’s determined to change their opinion by taking the Lions to the top of the international game. Sam Stosur has spearheaded Australia to a memorable Fed Cup World Group II victory over Slovakia by winning three rubbers in comeback fashion to guide her team home. Australia have iced their netball series with England with a crushing 16-goal victory on the back of a superb shooting display by Caitlin Thwaites and another standout performance by Sharni Layton. Wallabies coach Michael Cheika will do everything possible to ensure Toulon-bound playmaker Quade Cooper is not lost to Australian rugby. The All Blacks have shattered Australia’s Rugby World Cup dream, sending legendary duo Dan Carter and Richie McCaw out as back-to-back champions after withstanding an almighty Wallabies comeback.